When Andrea Danyluk joined the computer science faculty in 1993, the college asked what equipment she would need for her work. Her request of a SPARCstation 20, with four 50MHz processors, 512 MB of memory, and 1.05 GB of disk space and a separate 10 GB external hard drive was unprecedented, and extraordinarily expensive—the computer alone cost $18,000. Today, most inexpensive laptops have almost as much memory as her external hard drive did 20 years ago. They’re questions that Williams faculty have been asking since the mid-1970s, when introductory computer science, algorithms, and programming languages courses were taught by faculty in mathematics. Twenty-five years ago, computer science was becoming distinct as its own discipline, and these questions—what is a computer, what is information, and how can we structure information efficiently?—were increasingly demanding a faculty that could ask and answer them through research and in the classroom. 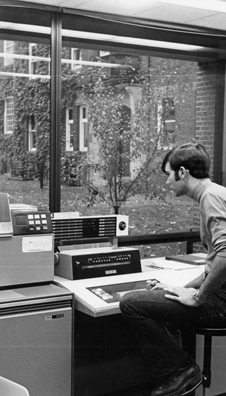 There was a friendly parting of the ways—indeed the departments still share many students—and the computer science department was born. “The split was natural,” remembers Kim Bruce, the department’s first chair. Danyluk adds, “Like other disciplines in the sciences, computer science has a strong theoretical foundation, it can be investigated experimentally, and it has practical applications.” And, more and more, computer science reaches into nearly every discipline. Bill Lenhart, who had to choose between computer science and math when the departments split, explains the thinking behind the development of the discipline. “We wanted our graduates to be well educated in the fundamental ideas of computer science, so they would be prepared for jobs in technology, for graduate school in computer science, for whatever field they chose,” he says. To that end, Williams faculty have been involved with the national conversation about computer science curriculum development for the last 25 years.